Fiji THIS WILL be F Fiji’s first participation at the FIFA U–20 World Cup and the squad will be looking to benefit from playing close to home, and with the support of an estimated 60,000 New Zealand–based Fijian supporters. While most of the squad play for Fijian clubs, central defender Mohammed Khan has played ASB Premiership football for Waitakere United and is looking forward to the tournament. “It will be a special atmosphere,” he said. “I will have a lot of my family coming from overseas just to watch me play, and make them proud.” Fiji’s group matches are against Germany (June 1), Honduras (June 4) and Uzbekistan (June 7). 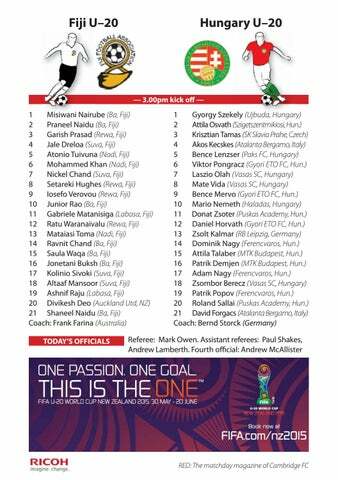 Fiji’s coach is Frank Farina, who played 67 internationals for Australia and was the Socceroos national coach for or eight eig ght yyears. played 147 games for Borussia Dortmund and 24 times for VfL Bochum in the German Bundesliga. After retiring as a player, he has held various coaching roles with German clubs and for two years, he was the national coach for Kazakhstan.